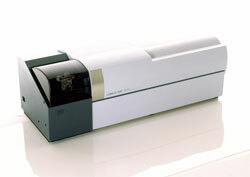 The LCMS-IT-TOF combines QIT (ion trap) and TOF (time-of-flight) technologies. When combining QIT and TOF, the greatest technological challenges were the efficient introduction of ions into the QIT and the simultaneous ejection of trapped ions to the TOF. The source design, desolvation capillary and reduced collision ion focusing Q-Array were adapted from Shimadzu‘s successful single-quad HPLC mass spectrometer. The Octapole Lens can introduce eluted ions from the LC to the ion trap by CII (Compressed Ion Injection) method efficiently. The ion trap QIT gives an efficient MSn capability with our new cleaning technology. In addition, BIE (Ballistic Ion Extraction) technology, provides high resolution / accuracy for all MS, MSn... modes. The temperature control of the flight tube gives a mass stability with stabilizing the length of the ion flight and ion acceleration voltage which affects the mass stability. Dual-Stage Reflectron gives an excellent resolution with optimizing energy absorption and time convergence. With the LCMS-IT-TOF, a variety of precursor ion selection criteria is available, such as the selection of ions in order of intensity or m/z, as well as intelligent automatic precursor selection, such as a monoisotopic peak selector and charge-state filtering. Automatically detecting and listing the peaks in large volumes of data is said to be the most important step in metabolomics and differential analysis. Profiling Solution software automatically aligns the retention times in high-mass accuracy data obtained by the LCMS-IT-TOF mass spectrometer and exports the resulting lists (matrices) to commercial multivariate analysis software. 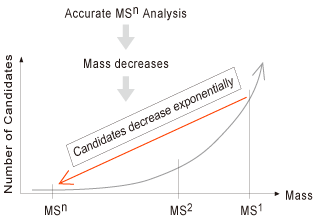 When using information-rich MSn data with the Formula Predictor software, formula predictions starts with the product ion having the smallest mass, and uses that result in the effective prediction of the parent ion by reducing the number of candidates.